It’s that time of year when people up North start huddling in their houses, putting extra blankets on the beds, and abandon their backyard barbeque pits. Makes you kind of glad you’re settled in here in southwest Florida where it’s getting to the time of year when it’s really comfortable to be outside. Of course being outside doesn’t have to mean dragging a lawn chair into the backyard and sitting in the sun. What’s great about living here in Florida is that you can take your home outside with you. So if you love being outside—but still want all the comforts of indoor living, adding a Lanai to your Naples-area home may be the perfect solution. It’s a great way to enjoy the light and the views in a comfortable, casual environment. If you’ve got a pool, it lets you enjoy soaking or swimming without fighting off wind or bugs. 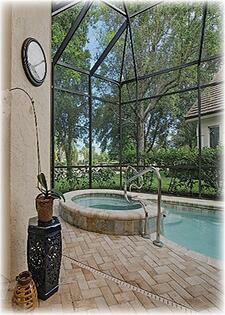 It also affords you a little bit of extra privacy and keeps your pool safe from unwanted visitors. You don’t have to have a pool, however, to enjoy Lanai living. It’s also a great place to enjoy outdoor eating. It’s a wonderful location for an outdoor kitchen as well—allowing you to grill and eat outside—or simply enjoy a beverage in a large open space. It’s a great way to expand your living space. For many Floridians, it becomes the favorite room in the home! If you’d like a closer look, click here on our photo gallery page and then click on LANAI CONVERSION to see the installation of a local Lanai as it progresses. Leave those northerners to their blankets and fireplaces! They may be headed indoors for the winter, but this is a great time of year to take your living outdoors—with all the comfort and style you can possibly want!